Flow cytometric analysis of Jurkat cells using AML1 (D33G6) XP® Rabbit mAb (PE Conjugate) (green) compared to concentration-matched Rabbit (DA1E) mAb IgG XP® Isotype Control (PE Conjugate) #5742 (red). 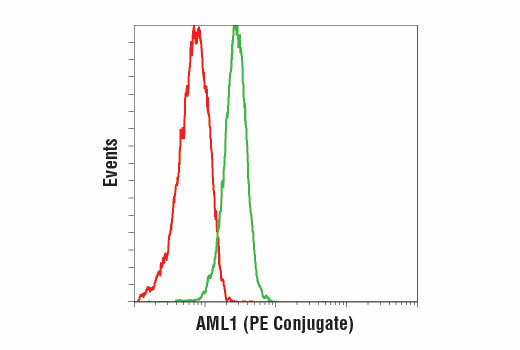 AML1 (D33G6) XP® Rabbit mAb (PE Conjugate) recognizes endogenous levels of total AML1 protein. Monoclonal antibody is produced by immunizing animals with a synthetic peptide corresponding to amino acids at the amino terminus of human AML1 protein. This Cell Signaling Technology antibody is conjugated to phycoerythrin (PE) and tested in-house for direct flow cytometry analysis in human cells. The antibody is expected to exhibit the same species cross-reactivity as the unconjugated AML1 (D33G6) XP® Rabbit mAb #4336. AML1 (also known as Runx1, CBFA2, and PEBP2αB) is a member of the core binding factor (CBF) family of transcription factors (1,2). It is required for normal development of all hematopoietic lineages (3-5). AML1 forms a heterodimeric DNA binding complex with its partner protein CBFβ and regulates the expression of cellular genes by binding to promoter and enhancer elements. AML1 is commonly translocated in hematopoietic cancers: chromosomal translocations include t(8;21) AML1-ETO, t(12;21) TEL-AML, and t(8;21) AML-M2 (6). Phosphorylation of AML1 on several potential serine and threonine sites, including Ser249, is thought to occur in an Erk-dependent manner (7,8). Wang, S. et al. (1993) Mol Cell Biol 13, 3324-39. Ogawa, E. et al. (1993) Proc Natl Acad Sci U S A 90, 6859-63. Okuda, T. et al. (1996) Cell 84, 321-30. Wang, Q. et al. (1996) Proc Natl Acad Sci U S A 93, 3444-9. North, T.E. et al. (2004) Stem Cells 22, 158-68. Blyth, K. et al. (2005) Nat Rev Cancer 5, 376-87. Tanaka, T. et al. (1996) Mol Cell Biol 16, 3967-79. Zhang, Y. et al. (2004) J Biol Chem 279, 53116-25.